AN POST HAS issued two stamps in recognition of the life and achievements of Martin Luther King Jr and Nelson Mandela. The stamps of the international statesmen and Nobel peace prize winners are intended for international mail and will carry a ‘W’ designation for worldwide posting. They were designed by Dublin-based design studio Aad. Martin Luther King, Jr was an American Baptist minister, activist, humanitarian and leader in the African-American Civil Rights Movement. He led the August 1963 ‘March on Washington for Jobs and Freedom’ where he gave his famous ‘I Have a Dream’ speech. He received the Nobel Peace Prize in 1964 for his non-violent campaign against racism. He was assassinated on 4 April 1968. People in the US and around the world have been marking the 50th anniversary of the assassination. The anti-apartheid revolutionary Nelson Mandela spent 27 years in jail as a political prisoner and after his release in 1990, he became the first black President of South Africa in 1994, serving until 1999. He was jointly awarded the 1993 Nobel Peace Prize with Frederik Willem de Klerk in recognition of the peaceful change over of government and their efforts to end apartheid. Mandela’s former wife Winnie Madikizela-Mandela died aged 81 this week. The stamps feature photographs of Martin Luther King, Jr. at the famous ‘March on Washington’, (© Hulton-Deutsch Collection/Corbis/Getty Images) and Nelson Mandela in Soweto, September 1990 (© Alexander Joe/AFP/Getty Images). They are available from the stamp counters at Dublin’s GPO, main post offices and online. Email “An Post issues stamps honouring Martin Luther King Jr and Nelson Mandela”. 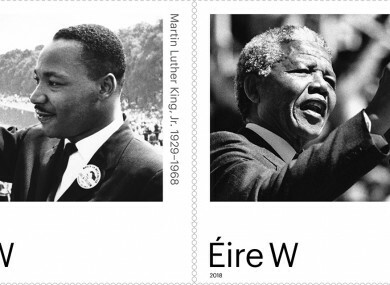 Feedback on “An Post issues stamps honouring Martin Luther King Jr and Nelson Mandela”.